The groundwork for a National Socialist takeover and Occupation of France was prepared in Canada in March of 1850. Shocking as it sounds, there is no denying the parallels. The pre-Bastiat appeal is primarily to unproductive hands (politicians, clergy) and other dim bulbs (cognoscenti, intelligentzia, workers). When Hitler’s armies conquered France in June of 1940, they changed the French national flag, motto and money. Liberté, Fraternité, Egalité became Travail, Famille, Patrie (Work, Family, Nation)–as befits a racial collectivist workers’ party (arbeiterparty). 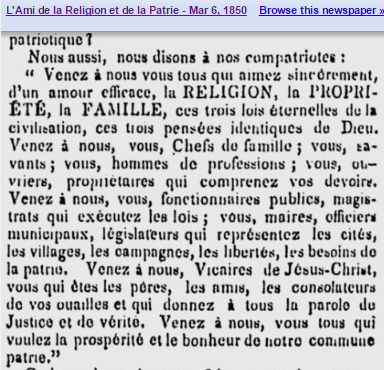 The 1850 Quebecois version above dinned Religion, Family, Property into its listeners’ ears. 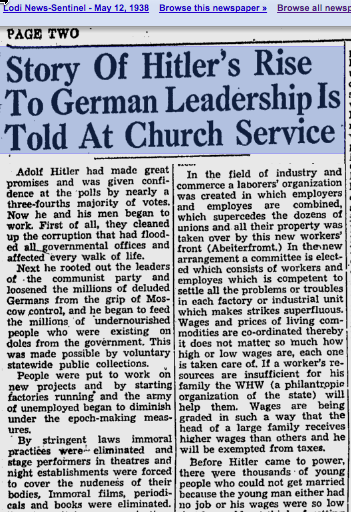 Quebec was 36% of Canada back then, and the country dominated by Catholics and Protestants–much like Germany when voters put the NSDAP in charge in 1933. Interestingly, Canada’s religious conservatives pushed through an anti-abortion law in 1968. Granted, this was less restrictive than earlier laws also prohibiting sale, distribution and advertising of contraceptives, but it was a shocking step back toward the Dark Ages at a time the US was electing Richard Nixon. A Canadian physician was arrested and charged, but the forming of the Libertarian Party–with a pro-choice woman on the ticket that earned an honest electoral vote–occurred in 1971-2. In 1973 a Quebec jury acquitted Dr Morgentaler and the US Supreme Court decided in favor of individual rights for women. Fanatics appealed, jailed the good doctor, made additional charges and intimidated Parliament with a petition to ban abortion. This backfired in 1976 and by 1982 Canadian legislation protected the rights of individuals, male and female. All medieval religious laws (except prohibition laws) were abolished in 1988, but mystical zealots resorted to murder and firebombing. The people remembered who had threatened and coerced them, and have since left the houses of organized mysticism in droves. 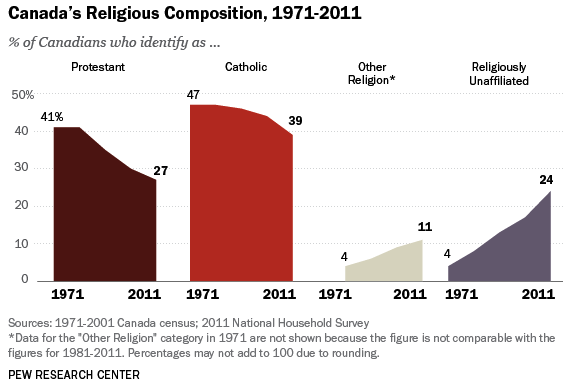 The good news is that there are 600% more nonmystical freethinkers in Canada than when Nixon Republicans were causing refugees to again pour into Canada. The bad news is that renewed attacks on individual rights have attracted other medieval mystical cults famous for mutilating women. Germany has suffered a similar reaction to its past behavior. National Socialists in East Germany were simply replaced with Soviet Socialists in the “denazification” program there. Here’s hoping Canada’s Libertarian Party Platform Committee drafts a suitable response to reassert freedom and rights before they’re gone with the wind. Need to acquire some second language assistance? Visit my translation service website. The most popular president ever at the 100-day mark was Harry Truman, who continued Roosevelt’s policy of keeping beer safe and legal. 7. We demand that the state pledge itself to assure the productivity and livelihood of citizens above all others. If it is not possible to support the entire population, members of foreign nations (non citizens) are to be expelled. 8. Any further immigration of non-Germans Americans is to be prevented. We demand that all non-Germans… be forced to leave the Reich immediately. 12. … personal enrichment because of war has to be seen as a crime against the people. We therefore demand complete confiscation of all war profits. 17. We demand land reform suited to our national needs, creation of a law providing for expropriation without compensation of land for common purposes, abolition of taxes on land and prevention of all speculation. 18. We demand a ruthless fight against those whose activities harm the common good. Traitors, usurers, profiteers, and so forth, are to be punished with death, regardless of church and race. 23. We demand legal measures against the conscious political lie and its propagation through the press. 24. We demand freedom for all religious denominations within the state as long as they do not endanger the state or violate the ethical and moral feelings of the Germanic race. All of these things, basically a nazification of These United States, are being pushed by Republican members of the House and Senate. 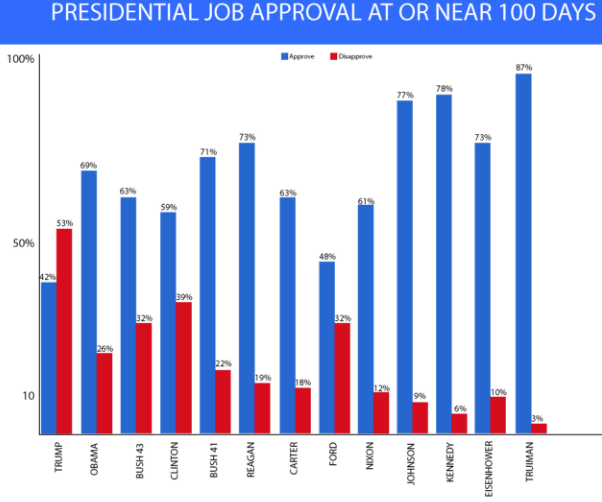 The president is simply pushing the unpopular GOP platform he was elected to push. Republicans were elected by default because of the Democratic Party’s platform plank aimed at crippling the US economy for econazi carbon-tax pseudoscience. The plank banning reliable power generation was the only deliverable difference among the 71,000 words the two major parties published as their nearly indistinguishable platforms. Americans simply voted to keep electricity safe and legal. The oppression of fertile women, anti-semitic religious warfare entanglements, and jailing and shooting of youths over plant cultivars were package deals added to the GOP platform by mystical bigots. Four million voters, equal to the voting population of Virginia, voted libertarian, causing the Republican candidate to lose in the popular vote count. The Libertarian platform offered to finish the work of repeal begun by the Democrats in 1932, and release millions of victims of victimless crime enactments–and keep electricity safe and legal. If you understood this interpretation, it might be because I interpret for engineers, courts and attorneys. 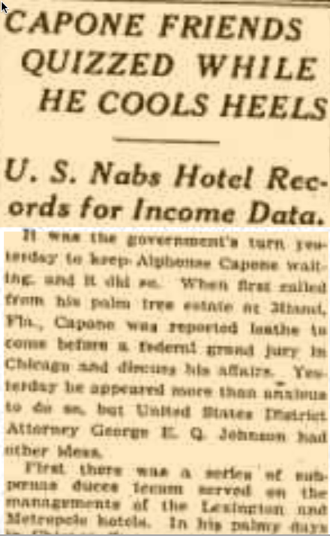 Those uppity Alaskans dared to imagine–like New Yorkers in 1923–that they could repeal their prohibition laws and still collect excise taxes? Think again! God’s Own Prohibitionists have appointed another Harry “Sessions” Anslinger to bring the death sentence to pot peddlers as promised by George Bush in 1989! The Juneau Empire now reports that legal hemptrepreneurs eager to pay the government’s hemp tax were turned away by Post Office Gestapo. Those asset-forfeiture experts would have nothing to do with the proceeds of dope peddlers–unless maybe an opportunity for civil asset forfeiture were to present itself. God’s Own Prohibitionists aren’t about to let the grass grow under their feet. Harrumpf! It remains to be seen which Alaska judge will sign a bench warrant for the arrest of federal meddlers interfering with State tax collection. Don’t blame me! I’ve was suckered by both looter parties back when I was young and stupid. Fool me once, shame on you. Fool me twice, shame on me! Of the three Libertarian candidates left standing at the convention, one was a recycled Republican indifferent to the individual rights of women (Johnson). Another was an antichoice Republican infiltrator bent on making the initiation of force to violate rights a Libertarian policy (Petersen). The third (McAfee) was a pro-choice newcomer in his first half-year of membership who enjoyed the persona of a loose cannon. The 2016 candidate spread is evidence of gradual infiltration by surplus mystical bigots of the sort now populating the Tea and Consta2shun parties–spoiler vote holdouts for another religious autocracy in violation of the First and Fourteenth Amendments. The result has been a crippled semi-Libertarian party, fully 2/3 male earning 3% of the vote–but with way more than half the potentially sympathetic electorate mostly alienated. Ask yourself how you would feel if some ex-GOP “Libertarian” candidate were to smugly suggest defunding the Center for Disease control and auctioning off all vaccination and epidemic control programs to corporate bidders? The program looks less like government handouts when men are also exposed to the unplanned need for medical intervention. 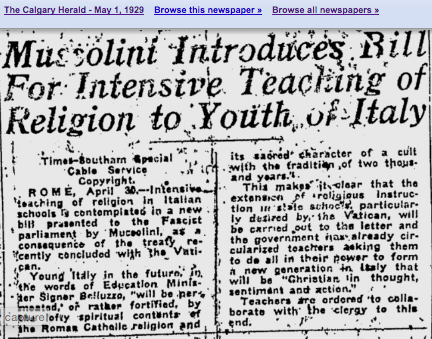 Never forget that the Italian Fascist and German National Socialist parties were deeply religious organizations. But Jewish voters were a tiny minority in Germany, Austria and Italy in 1933. Non-geriatric women voters in These United States amount to well over half the electorate. The Libertarian Party was the first viable party to feature a woman vice-presidential candidate. Tonie Nathan, a founding LP member who defends individual rights (choice) for women. The Libertarian Party won a rational electoral vote on December 19, and the Supreme Court smartly decided in Roe v. Wade that women were in fact individuals with the right to make their own choices–even if pregnant–on January 22, 1973. Time elapsed between the vote and the Supreme Court decision was 31 days. We further support the repeal of all laws restricting voluntary birth control or voluntary termination of pregnancies during their first hundred days. Yes it is true that post isn’t exactly propter. “All men are mortal” was once an untested hypothesis. But by logical induction understood by all but the most superstitious of mystics the generalization became a factual premise upon which valid conclusions may be rigorously drawn. But election campaigns are statistical affairs. Both of the looter parties seeking to install their tools and puppets on the government payroll with a hand in the till understood that infringing the individual rights of all female voters would be a really stupid thing to do. Even Germany and Italy learned the hard way that mystical demagoguery doesn’t pay. A Supreme Court decision to keep American women at the mercy of state legislatures dictated to by Klavern Christianity was one option facing the Court. But that choice made as much sense in 1973 as the 1932 Republican decision to keep light beer and wine a federal felony with a 5-year prison sentence and $10,000 (gold) fine. As a result of the Republican party selling out the voters, backing instead the Wizened Christian Temperance Union, Anti-Saloon League and Methodist White Terror, Democrats were elected to the top offices in 1932, 1936, 1940, 1944 and 1948. There was the stark result of that one episode of pandering to the demagogues of the coercive imposition of Comstock Laws embodying the mandates of mystical beliefs. The pre-urinalysis GOP was still smarting in 1973, having in the previous 40 years been defeated in 71% of all presidential campaigns since siding with the Klan and its dry cohort against “The Demon Rum.” New York repealed its liquor prohibition law in 1923, and “Whiskey” Al Smith–the NY Governor who had signed the bill into law–became the Democratic Party’s 1928 candidate. In 1970 New York–flanked by Hawaii and DC–repealed the most onerous of its antichoice legislation. Nine male political appointees saw the handwriting on the wall, and on Roe v. Wade sided with Constitutional freedom rather than the coercive imposition of religious practices. That is the line in the sand the Libertarian Party must again draw by deleting all of the “good faith” Vichy Plank language dictated by the shrinking remnants of dogmatized Prohibitionist infiltrators. In looter party platforms, “good faith” is invariably a pretext for overlooking violations of the Bill of Rights. The current “Vichy” plank is a cowardly reproach and stands as a monument to betrayal of the individual rights of fully half the population of These United States of America. Small wonder women voters looked elsewhere in 2012 and 2016. But they discovered that the Democratic party was about pseudoscience and the banning of electrical power generation, rather than the competent defense of individual rights. It is a safe bet that educated women voters will not repeat that mistake. We must by then offer them a clear alternative–a party eager to turn their spoiler votes into political clout that will admit of no spurious interpretation–by November of 2020. The libertarian party needs pro-choice female candidates to help rid us of the invasion of “former” religious bigots. Are you eager to understand the content of a political speech given in South America? Portugueseinterpreter.com offers quick sight translation, gisting, and even edited professional translations suitable for publication in English. Contact me. Florida Voters (not looters) Win Election! The treaty closed with a nondisclosure agreement that masked the existence of additional deals, but the thing was outwardly cute and fuzzy, as one might expect from neighboring altruistic People’s States. The fact remained that the preceding war had been largely a dispute over heroin markets in which to sell Papaver somniferum products grown in the Balkan States. Those markets and competition still existed in 1939. The secret additional deals amounted to a divvying-up of the opium-producing Balkan States. When the Democratic Party gained power after the George Waffen Bush asset-forfeiture crash and depression, it preserved existing domestic prohibition, high-taxes, asset forfeiture looting and other victimless “crime” legislation. However, stung by the Y2K election results in which the Green Party weighed in with enough spoiler votes to block Democrats from jobs, boodle and pelf, the Democratic platform committee hewed as close to the Republican line as possible–except for the part about trying to ban reliable power generation. Bans on reliable power generation have been enacted in the People’s State of Australia (which replaced voluntary democracy with mandatory voting), and the Democratic People’s Republic of Germany. In both cases, utility bills skyrocketed and rolling blackouts and brownouts became familiar features of the environment. These provide pretexts for additional regulatory meddling. The result of curtailment of power generation anywhere is a net increase in the mortality rate in those places–in other words, a health hazard. If this sounds like 2017, welcome to the world of alternative facts. This is the pledge required to join or donate to the Libertarian Party.